BBQueer takes place the first week of May each spring. BBQueer is an ALL AGES benefit event for LGBTQ youth in the Eugene, Springfield, Bethel, Cottage Grove community. The annual BBQueer features live music sponsored by the ASUO Women’s Center. Vegetarian and Pulled Pork Sliders made BBQ master and Education Studies professor Dr. Jerry Rosiek with his pit team Julie Heffernan and Tina Gutierez-Schmich. 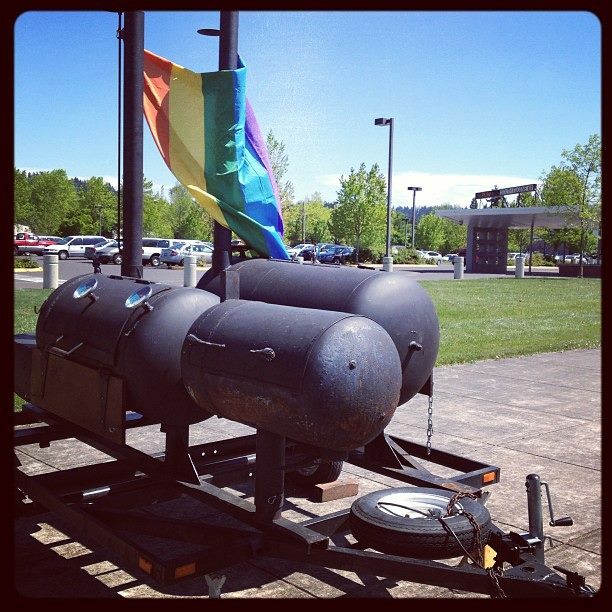 Pulled Pork Slider and Vegetarian Sliders sponsored by the UO Dean of Students LGBT ESSP office. Children’s and family activities run by the UOTeachOUT senior class in the Department of Education Studies. and a Silent Auction of fabulous items donated by generous members of the Eugene business community. Cost is $10 per plate for the BBQ and proceeds from the BBQueer support the regional Pink Prom which is inclusive of and affirming for LGBTQ youth. Proceeds from the BBQueer silent auction also support the 2016 UOTeachOUT Youth Leadership Summit.